Welcome to The Natural Playground. My aim is to teach children about the natural environment on their doorstep without having to travel to a remote location to experience ‘nature’. To encourage children to become explorers themselves and develop their own curiosity. This can then be introduced into their own families and their local community. I have set up The Natural Playground to run Environmental Education workshops for young people in the Edinburgh area. 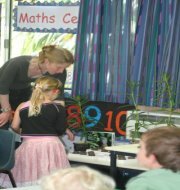 As a qualified primary teacher and environmental educator, I run units within schools teaching primary aged children. I also run after school workshops and holiday programmes.